With so much to prepare for your wedding day, why not take the guess work out of your jewelry needs and treat yourself to this elegant, silver wedding ring. The Sterling Silver 6mm Comfort Fit Wedding Band is a lovely size and shape, making it the perfect choice for the ring that you will wear proudly every day of your marriage. This traditional wedding band is cast in the finest sterling silver (.925) and has been polished to a flawless luster, creating a beautiful reflective surface. The band measures 6mm wide and has a contoured shape that is designed for the ultimate comfort fit so you can wear your ring all day and night. The exterior of the ring and the interior edges are slighted rounded into a precise shape that will feel good against the skin. This ring will fit so well on your hand that you will never want to take it off. Marriage is a lifelong commitment that you can celebrate everyday by simply glancing down at your hand to see your lovely wedding jewelry. This silver wedding band is an easy way to show your love and to remember the vows you took and that you hold so dear to your heart. *Ring is only available for 24 hour processing time in size shown. Ring is eligible for return only. 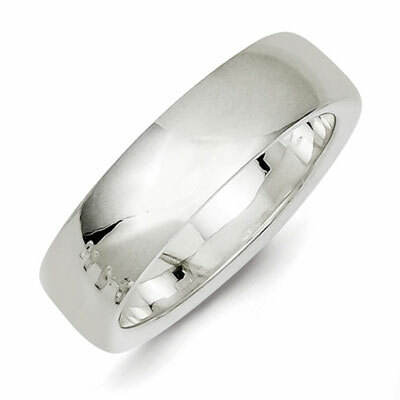 We guarantee our Sterling Silver 6mm Comfort Fit Wedding Band to be high quality, authentic jewelry, as described above.